The commonly used materials for structural members are steel, concrete and timber and they can be interconnected to one another through different connections. 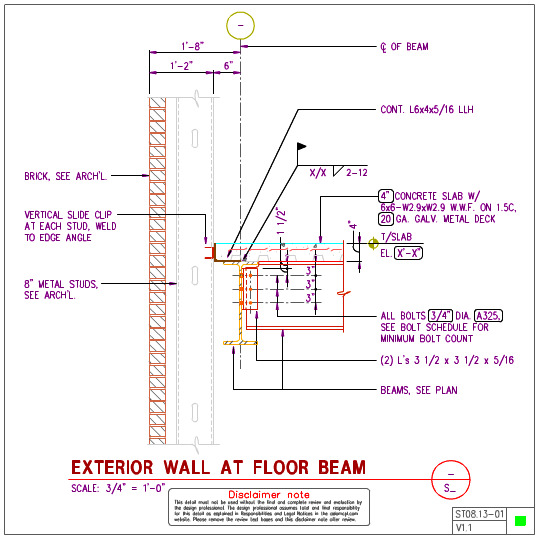 Most of these connections are made of steel.... For the web crippling capacity of steel stud flexural members with stud to track connections susceptible to web crippling, S136-07 refers to the North American Standard for Cold-Formed Steel Framing � Wall Stud Design, AISI S211-07. They include AISI D110 Cold-Formed Steel Framing Design Guide that may be purchased from www.cfsei.org, SEAOC Structural/Seismic Design Manual Volume 2 Example 3 that may be purchased from www.seaoc.org, and the Simpson Strong-Tie wall stud steel bracing design example on page 60 of the C-CFS-15 CFS catalog. Exterior Structural & Curtain wall. CEMCO's structural framing products are manufactured to the strict tolerances set forth by the 2012 and 2015 IBC, and verified by ICC-ES ESR#3016.